Friday and Saturday at 8pm. Playhouse Square, 1501 Euclid Avenue, Cleveland, Ohio. Call 216-241-6000 or purchase online. In two one-act plays, the chance meeting and “catch-up” conversation between two women, furthers and reveals a bond of friendship based on past experiences and higher education. The work, as presented by Cesear’s Forum, is entitled PLATH & ORION and comprises Lanford Wilson’s THE GREAT NEBULA IN ORION and Greg Cesear’s PLATH, SEXTON AND THE ART OF CONFESSION. In both, the women address their thoughts and comments directly to the audience, as well as to each other. Poignant, cutting, funny and poetic, their telling conversations reveal individual boundaries of hope and reality. Lanford Wilson was a Pulitzer Prize winning, American playwright and a pioneer of the Off-Off-Broadway movement. His plays were often ensemble pieces ruled not so much by plot as by the behaviors of rich characters both funny and heartfelt. His early career gave way to wider stages, Off-Broadway, Broadway and as a staple of regional theaters throughout the United States. Mr. Wilson was a founder of the Circle Repertory Company, a highly regarded collective of actors, directors, playwrights and others known for its collaborative approach. Sylvia Plath and Anne Sexton were Pulitzer Prize winning American poets, known for personal verse that furthered the genre known as Confessional poetry. They met at a seminar and their career work combined with personal rivalry and affinity links them together. Their lives and work are referenced in the latter piece. The plays are”companion” pieces designed for audiences to focus on and identify with the character driven narratives through inventive storytelling. The Cleveland production features Aimee Collier and Rachel Lee Kolis as former college roommates in THE GREAT NEBULA IN ORION, with Julia Kolibab and Mary Alice Beck as University colleagues in PLATH, SEXTON AND THE ART OF CONFESSION, presented respectively in a 90 minute production. Both will be staged by Mr. Cesear, with a setting by Derek Green, lighting by Andrew Kaletta and costumes by Aimee Kluiber. The production, sponsored in part, by Cuyahoga Arts and Culture, is presented in the intimate Kennedy’s space at Playhouse Square, most noted as the company’s home. 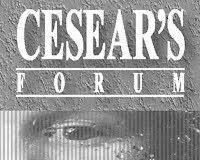 Cesear’s Forum continues to evolve a distinctive body of regional work with a social and experimental edge. Past productions have included adaptation and original material with work by noted genre playwrights that include: Samuel Beckett, Edward Albee, Yasmina Reza, Caryl Churchill, Peter Weiss and Eugene Ionesco.